1876: Alexander Graham Bell patents the phone. 1879: Thomas Edison unveils the lightbulb. 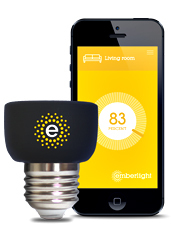 A bunch of years later: You get Emberlight, which lets you control lightbulbs with your phone. It’s available now for preorder. 1) When you’re waking up. Imagine your alarm’s a lamp with a slow sunrise effect instead of whatever horrible bleating sound you have now. Yep: pretty nice. 2) When a date’s over. You’re on the couch, the feeling’s right... You pull out your phone and say, “Watch this.” The light dims. We’re not saying it’s an aphrodisiac, but we’re not not saying that, either. 3) When you’re walking into a room. It’ll flip on the lights automatically like you’re some sort of god. Relax. It’s only reacting to the proximity of your phone. 4) When you’ve had a... fun night. And maybe you’ve ended up on the sofa/floor/unknown. This’ll make it dark without you getting up. 5) When you just feel like controlling light with your g.d. phone.